As two poets get ready to take off on a 30-day journey from Boulder to Beloit, Wisconsin, making stops along the way to build Little Free Libraries, Chloe Veltman talks to library director Pam Smith about the many ways libraries are evolving. Laura Palmisano, a reporter at NPR member station KVNF in Paonia, takes a look at an outdoor mural in the town of Hotchkiss that is grabbing the attention of residents and passersby -- leaving people in wonder about how the artist created the work. In the latest installment of CPR’s series about storytelling, “Second Listen,” expert storytellers Andrew Orvedahl and Robert Rutherford explore how we represent ourselves and our personal narratives through our resumes. Have you seen Little Free Libraries springing up in your neighborhood? 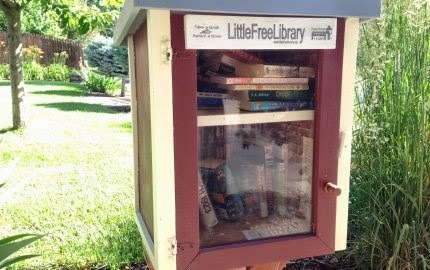 Share photos of the tiny libraries in your community with us at arts@cpr.org.